Allerbester was bred in 1997 in Germany by Heinz Reismann. Sired by Federal Dressage Champion Alabaster, this stallion clearly demonstrates the imprint of his sire. Alabaster, this former Federal Champion of young dressage horses is shaped by his refining ancestor, the foundation sire Abglanz, who established the radiance and beauty of the Trakehner in the Hanoverian breed after World War II. He is a horse of incredibly beautiful conformation and outstanding basic paces. Alabaster has competed successfully through Grand Prix level. He passes on his talent for dressage to his progeny, and has a breeding index in dressage of 143 points. Allerbester's dam, is no slouch either. State Premium mare Wiscaria is sired by Walt Disney I, winner of his Stallion Performance Test at Adelheidsdorf. 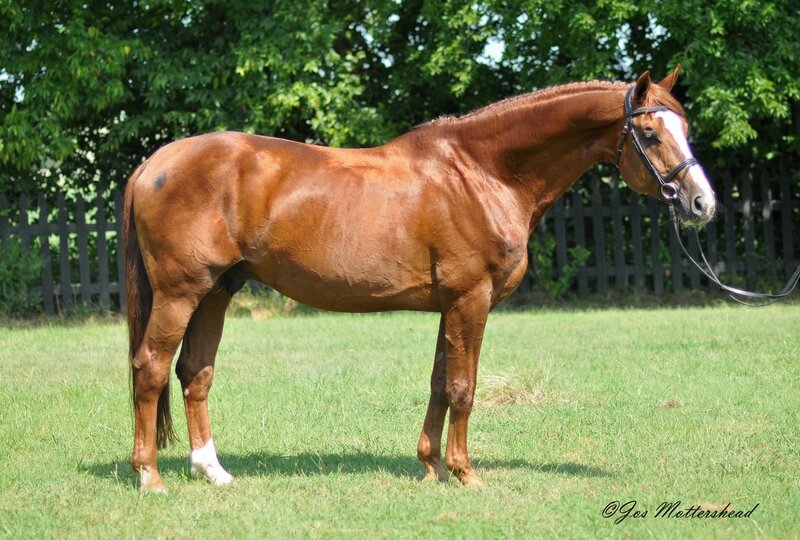 A champion in advanced level dressage, Walt Disney I is sired by World Cup I - twice Vice Champion DLG stallion and was proclaimed "Hanoverian Stallion" of the year in 1997. Allerbester demonstrates correct conformation, elastic gaits and a very rideable workman-like disposition. He successfully completed his 100 Day Stallion Performance Test in California in 2000 at the young age of 3 with only 3 months of riding experience prior to testing. Allerbester demonstrates a kind and willing temperament with a puppy dog personality. A large framed stallion, he will add heigth, bone and a user friendly temperament. Allerbester is fully licensed and approved with the German Oldenburg Verband, Westfalen and Rheinland Pfalz-Saar International. Video footage of the stadium jumping and free jumping of Allerbester's 100 Day Stallion Performance test in 2000. He was three at the time he completed his performance test.